Woods is looking for the best offer. According to netsdaily.com, Qyntel Woods did take part in workouts with the New Jersey Nets. Qyntel Woods, the 6'9" swingman who played for the Blazers, Heat and Knicks before heading to Europe, was in for a workout. Johnson says he liked what he saw, but wouldn't say if Woods will be joining the Nets. Woods was charged in a bar fight two weeks ago in Poland. An article from Poland and koszykowka.net, says that the Nets did make an offer to Woods after all. 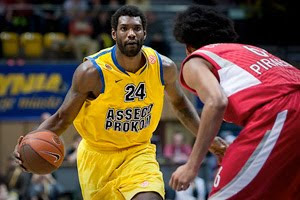 His agent did admit that there is an offer from the Nets but he also said that Woods is closer to staying with Prokom. This means that either the offer wasn't big enough or he actually wants to stay in Poland and Prokom. It could also mean that Woods is waiting for another offer.. from a wealthier team..